The first Marian apparition in history appeared to Saint James the Apostle, the brother of Saint John the Evangelist, on the bank of the river Ebro in Saragossa, Spain. Unlike every other recorded apparition, this one took place during the earthly life of the Mother of God. According to tradition, she had promised Saint James that when he needed it most in his difficult mission to the pagans in today's Spain, she would appear to him to encourage him. The church of Our Lady of the Pilar in Zaragoza, is the first church dedicated to Mary in history and it remains standing to this day, having survived invasions and wars – in the Spanish Civil War of 1936-1939 three bombs were dropped on the church and none of them exploded. Our Lady is also said to have given the small wooden statue of the apparition to Saint James which now stands on a pillar in the church. Nuestra Señora del Pilar is the patron of Spain and all Hispanic peoples. 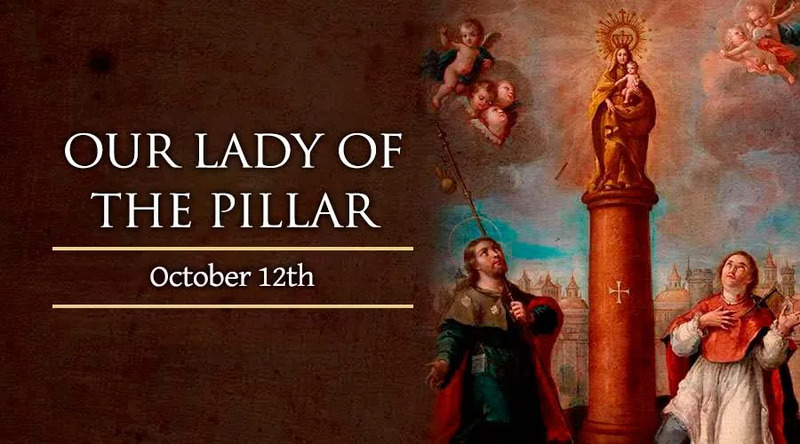 October 12, 1492, the feast of the Virgin of the Pillar, is the day Christopher Colombus first sighted American land, and when the first Mass in the Americas was celebrated.